Gunnera manicata, commonly named, Dinosaur food, is one of the biggest and most spectacular, architectural, herbaceous plants, commonly thought of as Giant rhubarb. This perennial can height 6-8 feet tall and spread over 8-10 feet. Gunnera manicata is native to the cloud forests of the Andes, mainly places like Chile, Costa Rica, and Columbia. They can be kept in pots for a few years, but of course won't grow as large as they would in the ground. They can be kept growing all year in a greenhouse in which it doesn't freeze. These magnificent, big, bold perennials develop enormous leaves that can grow 4-8 feet across, making this one of the world's largest herbaceous plants. 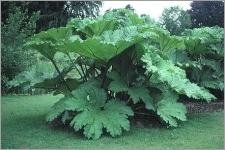 Although these dimensions are seldom see in cultivation, 4' leaves and plants 8' high and 12' wide are not uncommon. Growth is fast if the plant is happy. The plant has spines or sharp edges; use extreme caution when handling. Where Winters are mild, the leaves will last more than 1 year but in colder climates the leaves die-back to the roots in Winter. During the Summer statuesque spikes of tiny reddish-green flowers appear.